Ok, these are given. How about those accidental things that might happen on the internet? Like clicking on a link or banner that might open an inappropriate website? You can teach your kids to be responsible (managing the pull factor) but we have to also try to protect them from push factors. And this is where OpenDNS comes to our ‘rescue’. In layman’s terms, DNS is the layer that is located between your computer and the web, it allows you to connect to different websites on the web. DNS is normally managed by your Internet Service Provider (ISP). DNS also has a capability to block and unblock different websites. Normally, DNSs will be managed by countries’ ISPs. And unless you live in a country that monitors the internet, most of the time ISPs do not really block websites. OpenDNS is a service, that provides DNS services. It allows you to block websites by category (e.g: gambling, adult etc.) or by URL or by Level (High Security, Moderate, Low and Custom). That means when you are using OpenDNS, all your connections (access to websites) will be going through OpenDNS and will get filtered based on the rules that you have setup. Setting up OpenDNS is pretty simple. First, register for an OpenDNS Home account. It’s free. Next, follow on what type of device you want to set it up. Normally, it’s your PC or Tablets/Smartphones. Click on the appropriate device icon to see the instructions for it. In the knowledge area, find the particular OS that you are using (e.g; Windows 7, 8 or 10). 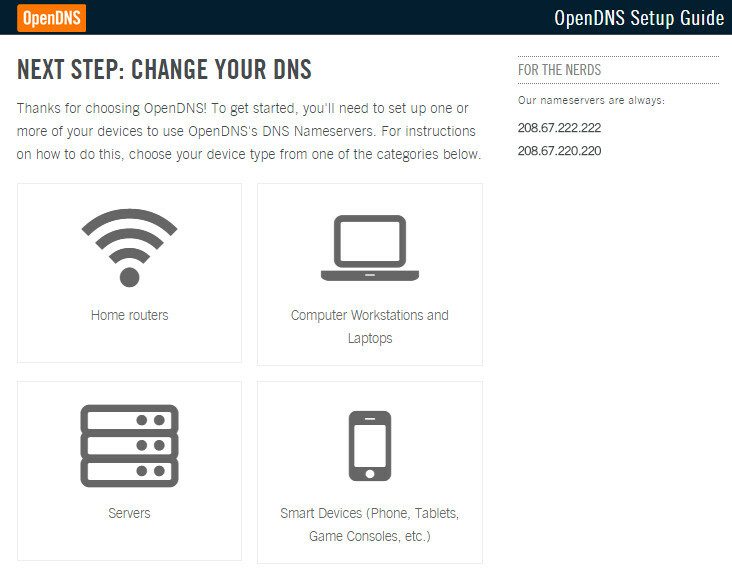 Follow the steps on how to enter the IP Addresses of OpenDNS into your device’s internet connection settings. (For example if you are running Windows 10 on your laptop, click here). Once you have correctly set it up, click on the link (as shown below) to test your settings. If your settings are correct, you should see a “Success!” notification as below. After you have setup the connection successfully, login to your OpenDNS account. (Looks like their user flow is not correct, since they are missing “login” link at the end of the flow. Instead, they have a “sign up” link). Nevermind, click here to login to your account. After you login to your account, you should see a big button “Add a network”. Click on it to setup your Home network. You can then customize the filtering rules for it. It’s best that you do the setup this portion at home, because it will require you to enter your Home IP Address. When you do it at home, it will auto-detect your IP Address, otherwise you have to remember and enter a correct IP Address. If you are at home – just click the button “Add this network”. In the next window, give a name to your network and press “Done”. If you don’t know whether you are using Dynamic IP Address, most probably you are, so leave that ticked. To configure the rules further, click on the IP address as shown below. Select the appropriate level or choose Custom to see different types of categories that you can block. Once you are satisfied with your selection, press”Apply”. You are now basically done. Depending on which filtering rules you have setup, some websites should be blocked when you type their URL in your browser. If you want to use OpenDNS on your other devices, just follow the instructions in the Knowledge Base for those particular devices of yours and they too will be protected. From time to time, you can login to your account and check Stats section to see how effectively OpenDNS has been protecting your family from inappropriate websites. Hope you benefited from this post. Let me know if you have any questions. Leave your comments below. Note: Unfortunately, OpenDNS won’t be able to filter inappropriate videos within YouTube. For that, you should enable Restricted Mode in YouTube or YouTube apps in your handheld devices.